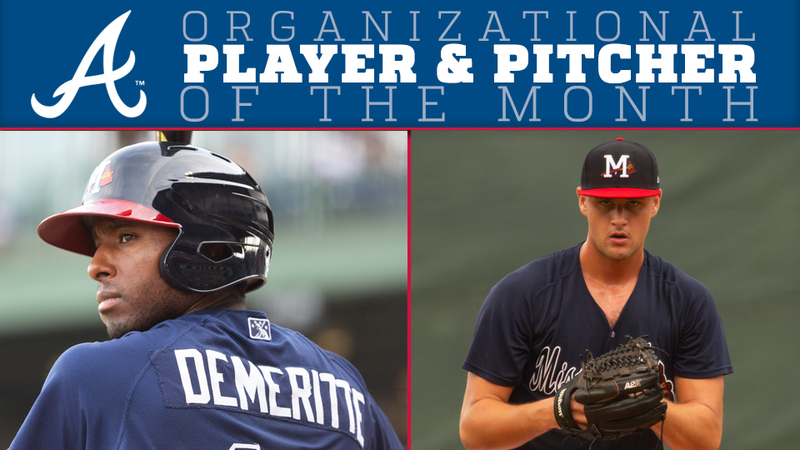 Pearl, MS -- The Atlanta Braves announced on Sunday that Mississippi Braves outfielder Travis Demeritte and starting pitcher Kyle Muller have been named the club's Player and Pitcher of the Month for August. Demeritte, 23, has been named Player of the Month after posting a .265 batting average (22-for-83) in August with four doubles, a triple, five home runs, 14 RBI, 13 walks and .371/.518/.889 slash line. The New York, NY native hit three home runs and scored eight runs over a three-game stretch, August 9-11 at Jacksonville. Demeritte recorded his first two-homer game of the season and ninth of his career on August 9, scoring a career-high five runs and finishing 3-for-4 with two homers, four RBI, five runs and two walks. Demeritte had two multi-homer games for Mississippi in 2017, on August 2 at Mobile, and June 3 at Jackson, TN. Demeritte had five two-homer games in 2016 while playing for High Desert in the Rangers organization. Demeritte is just the fourth M-Braves player since 2005 to record 16 homers in a single season (Matt Esquivel, 2007 - 19, Mauro Gomez, 2010 - 16, Ernesto Mejia, 2011 - 26). He currently leads the club in runs (69), extra-base hits (44), home runs (17), RBI (63), total bases (178), games (128) and walks (57). His 44 extra-base hits rank T-5th in the Southern League. The Atlanta Braves acquired Demeritte from the Texas Rangers in exchange for LHP Dario Alvarez and RHP Lucas Harrell on July 27, 2016. He was originally a first-round selection (30th overall) by the Texas Rangers in 2013 out of Winder-Barrow (GA) HS. Muller, 20, has been named Pitcher of the Month after going 4-1 with a 3.10 ERA (10 ER/29.0 IP), six walks, 27 strikeouts, 0.97 WHIP and a .206 opponents batting average in his first month at the Double-A level. The Atlanta Braves No. 11 overall prospect became the first M-Braves pitcher since Jose Ortegano in 2009 to win his first three M-Braves starts. He then became the first M-Braves starter to win his fourth consecutive start and recorded his second-straight quality start in 6.0 innings of work on Saturday, August 25 vs. Biloxi. The Dallas, TX native notched the first complete game of his career, shutting out Chattanooga on just five hits on August 18 in game one of a doubleheader 1-0, striking out five and waliking none. Muller was added to the M-Braves roster on August 5 from High-A Florida. The 6'7" lefty made 14 starts going 4-2 with a 3.24 ERA (29 ER/80.2 IP), 32 walks, 79 strikeouts and 1.39 WHIP for the Fire Frogs. Muller was promoted to High-A Florida from Low-A Rome on May 8. With Rome, Muller made six starts going 3-0 with a 2.40 ERA (8 ER/30 IP), eight walks, 23 strikeouts and a 1.07 WHIP. Muller completed the 2018 season 11-3 with a 3.03 ERA (47 ER/139.2), 46 walks,129 strikeouts and a 1.23 WHIP in 25 starts. Muller leads the organization in wins and ranks sixth in ERA. He was named Rome's Pitcher of the Month in April and Florida's Pitcher of the Month for June. The Atlanta Braves selected Muller in the second round (44th overall) of the 2016 draft out of Jesuit College Prep (TX) after being named 2016 Gatorade National Player of the Year. Muller committed to play baseball at the University of Texas, but opted to sign with the Braves. The M-Braves conclude the 2018 season with the sixth and final game of the series in Jacksonville. Mississippi was eliminated from playoff contention on Saturday despite a 34-24 record since July 1, the third-most wins in the Southern League over that span.